The video specifically targets higher-level audiences and assumes understanding of some of the terms in the video. With younger audiences, background knowledge will be necessary. Educator should take extra care to explain parts of the video that may promote the misconceptions mentioned in the science annotation. 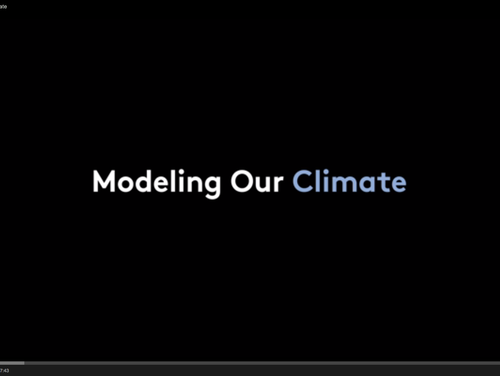 The video gives a clear explanation of global climate models (GCMs), and relies on model results from the 2007 IPCC report. Some of the graphics/explanations might be confusing or misleading. For example, when the video explains climate conditions (e.g. incoming solar radiation, movement of air masses), moving thin lines are used for each element. The placement of these lines, for example a line pointing to a cloud to signify incoming solar radiation, does not completely correspond with the mechanism. Second, the video uses the example of coin flips to explain probability. By pairing a random event (coin toss) with GCM (Global Climate Models) output, the idea of probability is not adequately explained but instead leaves the viewer with a misconception that GCM results are random. Video does a good job of explaining grids, and cells, and time steps used in GCMs. It also does a good job using real data to explain the model results and how they support evidence that climate change is caused by humans. Comments from expert scientist: It is a very clear and easy-to-understand resource. Some knowledge is anticipated, such as atmospheric layers and greenhouse gases. As the resource is kept very simple, it could generally be used for any non-scientific target group. The video has rich graphics that are used to explain the concepts. There is a bit of a mismatch between the cartoon-style graphics and the complexity of the topic. Some upper level students may be turned off by the graphical elements, but the content is robust. Make sure that students don't miss the idea that the models have proven to be correct, even when current scientific understanding lacks the explanation for that. The video has very high-production quality and is easy to view on YouTube.